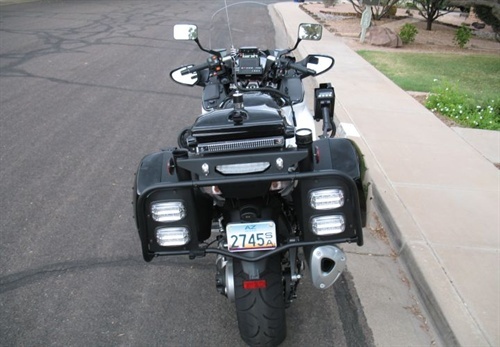 A new police-specific variant of Kawasaki's Concours 1400 from an Arizona dealer brings additional features designed to enhance safety for motor officers. The motorcycle has already made a splash among law enforcement test drivers as the Concours 14P, a police version of the civilian 1400 introduced by an Idaho police dealer. Now, Mesa, Ariz., dealer Kelly's Kawasaki takes its crack at a police version of the bike that it's calling the Kawasaki ZG1400 Enforcer. Kelly's and up-fitter Probity Cycle have made a few modifications that differentiates their bike from the Idaho version. And they've done it with input from a 15-year motor officer. Cory Calkins, a medically retired motor and vehicle crimes sergeant with the Mesa PD, provided input to the Kawasaki dealer about features benefitting motor officers. He coordinated the Mesa PD's purchase of 21 of the bikes, before retiring, and taking the position of government sales representative with the dealer. "Kawasaki is known for its low maintenance and bottom-line pricing and the ZG1400 is no different," Calkins tells POLICE Magazine. 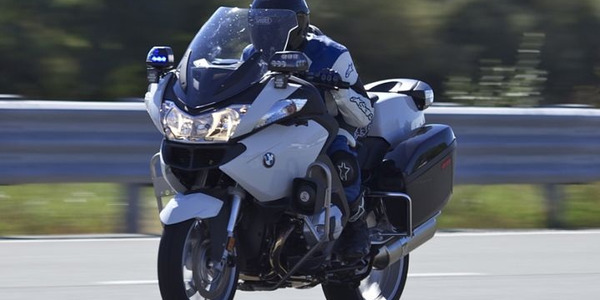 "In today's tight budget restraints, municipalities around the country are looking for an affordable police package motorcycle that can better protect the rider and the motorcycle during everyday police functions and training." The Enforcer starts with the same stock bike sent to Idaho by Kawasaki. This powerhouse arrives with a 1352cc, four-cylinder, liquid-cooled engine that (in the Concours 14P configuration) topped out at 131 mph at the Michigan State Police vehicle tests, and reached 0-60 in 4.5 seconds. Unlike sleepier cruiser bikes, the stock Concours 1400 is build on a racing platform — a monocoque aluminum frame that's designed for stability and sport-touring riding. Traction control and ABS braking are standard. Building on these impressive raw materials, Kelly's Kawasaki and Probity added "drop bars" designed to cushion a fall of the bike during training. Mounted to each side of the bike, the drop bars protect the fairing if an officer drops the bike during cone-pattern training. 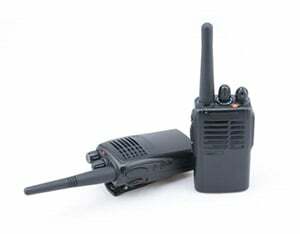 The Enforcer also uses only one battery to power its electronic police gear. Calkins recommended higher-quality LED emergency lighting, he said, to reduce the power draw from the battery. The bike arrives with a radio kill switch so an officer can preserve battery life when booking a subject or processing a DUI. The decision to use high-quality LEDs also allowed for 15 emergency lights, as well a white takedown light for nighttime traffic stops and DUIs. The later rotates with the handle bars, and can be pointed toward the driver to allow an officer to approach a vehicle's passenger side and draw less attention. 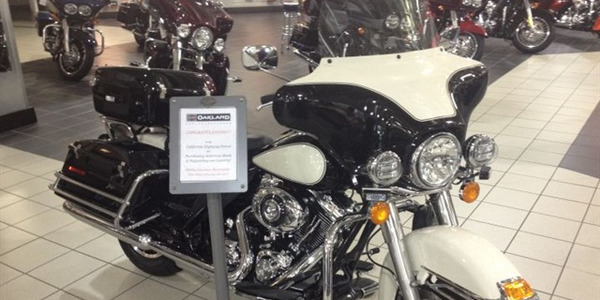 Kelly's Kawasaki becomes the second dealer to offer a police version of the Concours 1400. The first was Beaudry Motorsports of Post Falls, Idaho. That group offered the Concours 14P, and has since reorganized as Kawasaki Authority Sales. Kelly's Kawasaki is offering the Kawasaki ZG1400 Enforcer for $23,000. As the POLICE Web editor, Paul Clinton contributes posts about patrol cars, motorcycles, and other police vehicles. He previously wrote about automotive electronics as managing editor of Mobile Electronics. Prior to that, he was an award-winning newspaper reporter. The Los Angeles County Sheriff's Department conducted its annual evaluation of 2018-model-year police vehicles from Oct. 10 to 13. 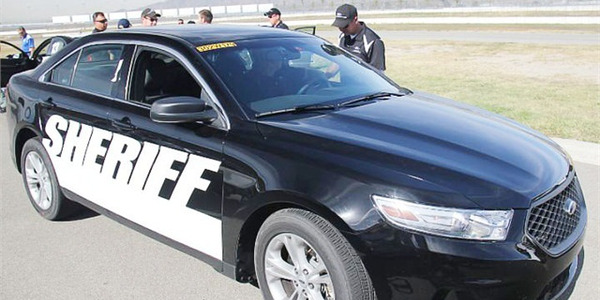 Agency deputies got behind the wheel of 13 four-wheel vehicles and five motorcycles for the testing. This year, the Los Angeles County Sheriff's Department evaluated 21 pursuit-rated vehicles — nine sedans, nine motorcycles, and three SUVs — in various categories including acceleration, dynamic handling, braking, and ergonomics. 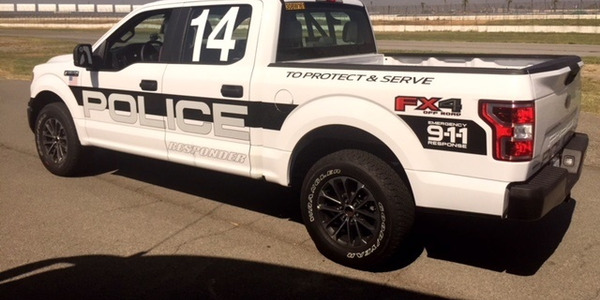 The Los Angeles Police Department has brought versions of Ford's Police Interceptor sedan and P.I. 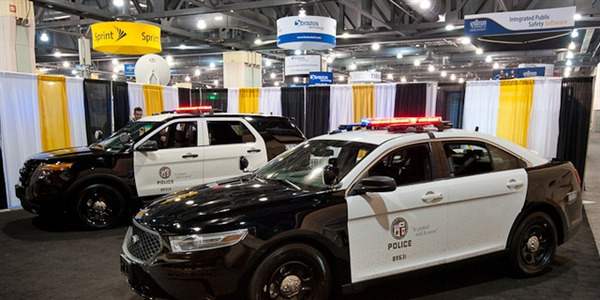 Utility to the IACP Conference in Philadelphia that showcase a high-tech, less-cluttered patrol car of the future. We're living in a Golden Age for police motorcycles. 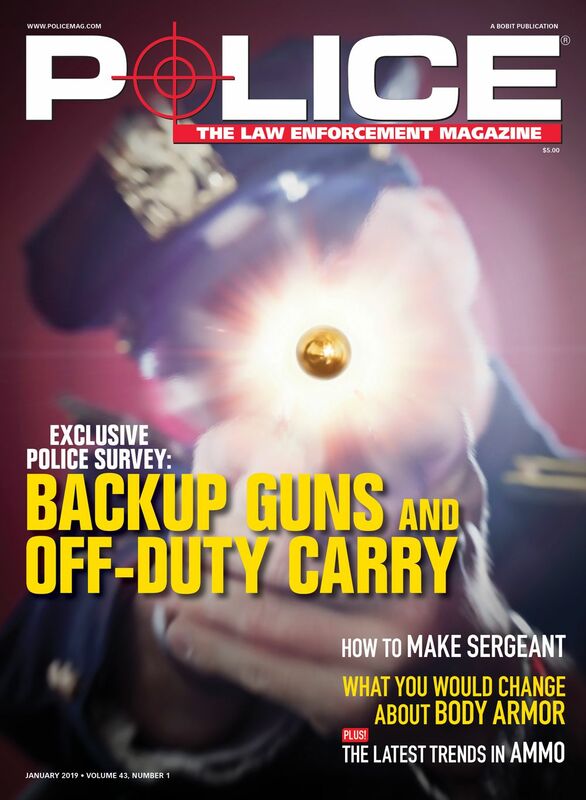 Law enforcement agencies have plenty of quality options, and more cycles may be on the way. We picked three motor officers in Southern California to profile three widely used cycles. Three newcomers to the police motorcycle market fared well during the Michigan State Police's annual evaluation of law enforcement vehicles that takes place each September. 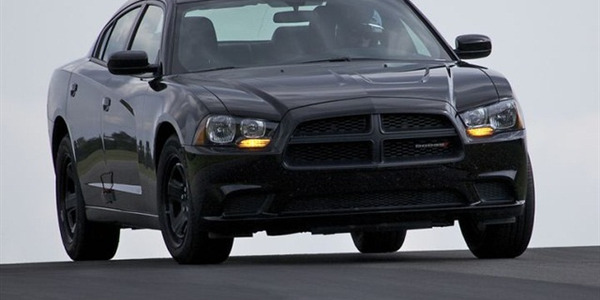 The Michigan State Police's Precision Driving Unit valuated 12 sedans and three pursuit-rated utility models available to police agencies for the 2014 model year. 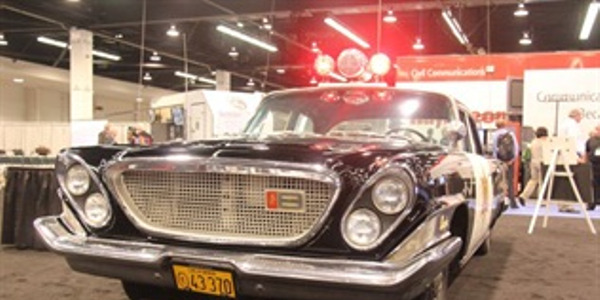 The Orange County (Calif.) Sheriff's Department issued 1962 Chrysler Newport sedans that offered deputies a 5.9-liter, V-8 (361 CID) rear-wheel powertrain with push button transmission. The engine was rated at 265 hp. 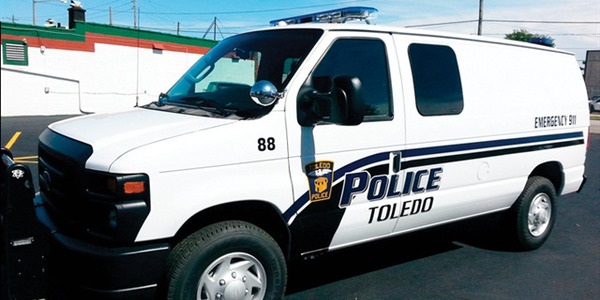 Rather than investing in a heavy duty bus, the Toledo (Ohio) Police Department has converted more economical Ford E-Series vans to round up disorderly college drunks and other scofflaws at chaotic scenes. 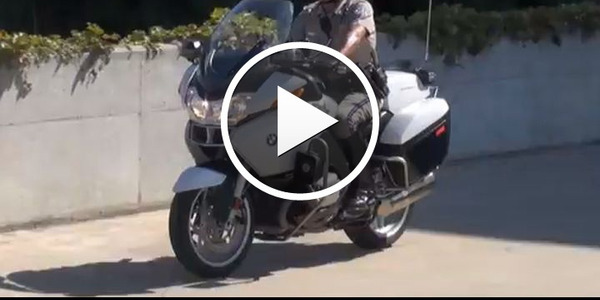 An Oakland Harley-Davidson dealer has begun delivering Harley-Davidson police motorcycles to the California Highway Patrol following a contract with the agency to provide up to 400 new motorcycles. 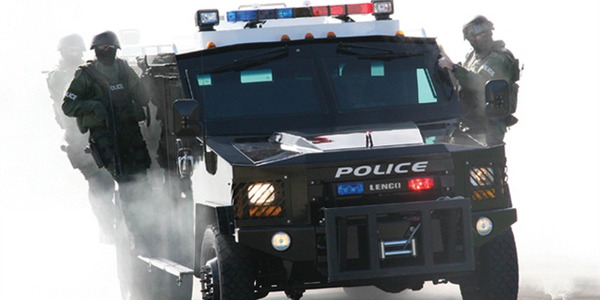 Armored vehicles are a mobile force multiplier for law enforcement, and in this extremely violent era, they are essential equipment. Stealth motorcycles may be less common, but that could change. 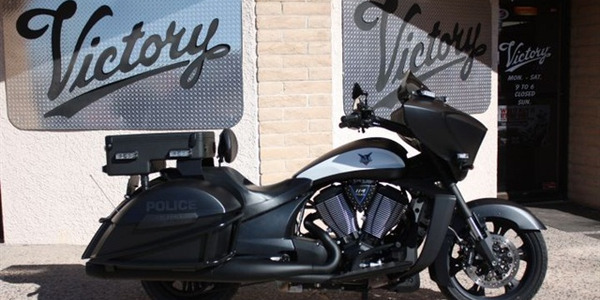 Victory Motorcycles has introduced a stealth version of their Commander I police motorcycle. The cycle's black-out paint scheme gives it a smoother, more polished look. 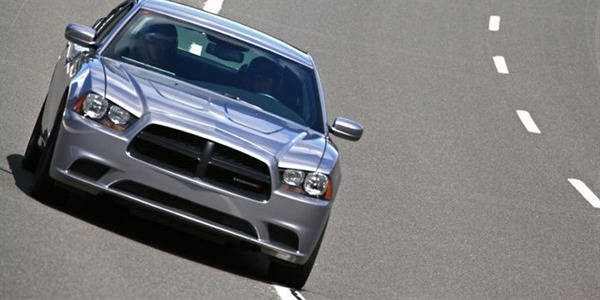 The Michigan State Police will test four new police motorcycles and Chrysler's new all-wheel drive Dodge Charger Pursuit this year among the 22 police vehicles evaluated for law enforcement purchasers. 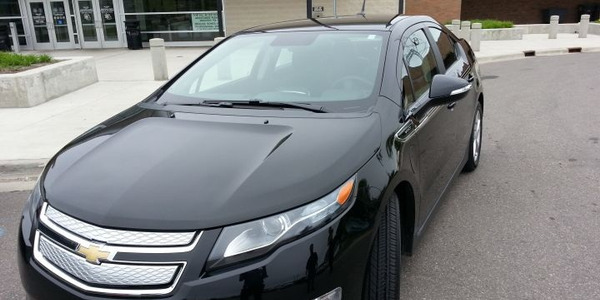 To help reduce the carbon emissions of county fleet vehicles, the Washtenaw County (Mich.) Sheriff's Office purchased an electric Chevy Volt to convert for patrol duty. 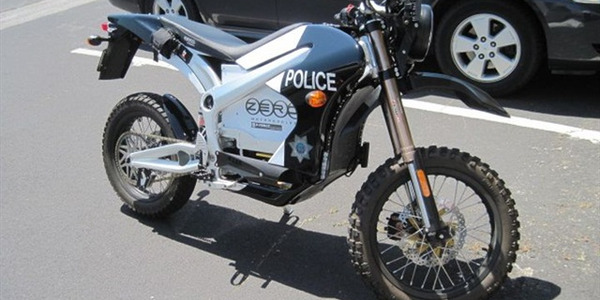 The Sebastopol (Calif.) Police Department found itself ahead of the curve, when Zero Motorcycles introduced a police version of its electric DS motorcycle. An enterprising sergeant with the agency had already done just that. 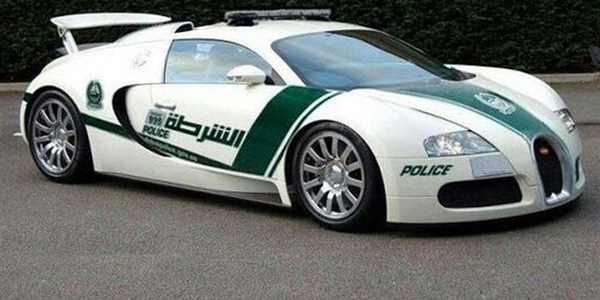 Dubai officials continued their lavish spending on exotic vehicles for their police force by adding a Bugatti Veyron. The Veyron would be the latest supercar acquisition that has also included a Lamborghini Aventador.